Posh chairman Darragh MacAnthony (far right) with, from left, David Farrell, Mark Tyler and Grant McCann. Photo: Joe Dent/theposh.com. Mark Tyler is delighted to be working for a ‘great guy’ at Peterborough United. Tyler’s role as player/goalkeeping coach for next season was confirmed alongside the appointment of Grant McCann to the post of first-team boss. Tyler has agreed a one-year playing contract alongside his coaching deal. Former Posh winger Dave Farrell has been named as the club’s under 21 manager, while Jack Collison will continue to manage the under 18 side. Posh will also reveal the identity of an experienced coach to help McCann as he takes on his first permanent manager’s job. “I’m absolutely delighted with the news,” Tyler admitted. “Grant is a great guy and he is managing a great club. “I’m also delighted to be part of his management team. I know I left this club for a time, but I never stopped supporting them so to be given the chance to help them back into the Championship is exciting. “Make no mistake reaching the Championship is the target next season. That will be the main aim and we will put together a squad capable of achieving it. “The chairman has made a wise choice giving Grant the job. He is respected by everyone for what he did as a player and he’s respected for the standard of his coaching. “From my own point of view I want to play as well as coach. Ben Alnwick is the number one and I will help him. I rate him highly and if we can get to his best form he will be a key man in a promotion push. “I want to push him by training well. I want to put him under pressure for his place. I enjoyed playing in the last three matches and as long as I’m fit and health I want to carry on playing next season. Alnwick is one of the players whose Posh contract expires at the end of next season. He will hold talks with McCann, but will be placed on the transfer list as per club policy if he fails to agree a new deal. 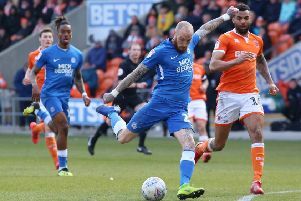 Tyler (39) returned to Posh after a seven-year spell at Luton earlier this year and extended his club appearance tally to 489 by playing in the last three matches. That’s the second-highest total in Posh’s Football League era behind Tommy Robson (559).